A small start to Saturday with bumpy and lumpy conditions, while into the afternoon a new inconsistent long-range SW groundswell filled in. Sunday was nice and clean as the swell eased from an inconsistent 2-3ft on the Surf Coast, bumpier and a little bigger to the east. This morning the start of our better and more consistent W/SW swell energy has showed with good clean 3ft sets on the Surf Coast and 4-6ft waves to the east. A stronger pulse of groundswell due this afternoon is showing really well on the Cape Sorell wave buoy and we should see the Surf Coast reaching 4ft with 6ft+ sets on the Mornington Peninsula with sea breezes. This afternoon's increase in moderate to large W/SW groundswell is the first of two due this week, with the second expected into tomorrow afternoon. This secondary pulse is being generated by the strongest of the fronts that have moved through our swell window the last couple of days. 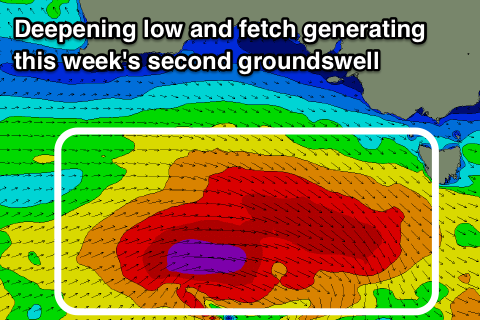 It's currently south of the Bight with a great fetch of severe-gale W/NW winds and tight storm-force fetch at its tail. A deep low pressure centre should form today resulting in the tight core winds expanding in size a touch. This will see a great fetch of storm-force W/SW winds generated in our south-western swell window before the system dips east-southeast under Tassie this evening. What we should see is a large pulse of W/SW-SW groundswell later tomorrow afternoon and into the evening. We'll see today's swell back off temporarily back to 3-4ft on the Surf Coast tomorrow morning and 5-6ft on the Mornington Peninsula, with the new swell kicking back to 4-6ft on the Surf Coast swell magnets and 8ft on the Mornington Peninsula later in the day. Conditions through the morning will be favourable for most spots with a variable breeze out of the north ahead of fresh S/SE sea breezes developing later morning/midday. The swell is expected to ease through Wednesday from 3-5ft and 6ft to possibly 8ft respectively and conditions will again be good with variable tending northerly winds, with afternoon sea breezes holding off longer and likely not developing until early afternoon. As we move into Thursday an approaching front will bring a W/SW-SW change as the surf continues to slowly ease, slowed as a mid-period W/SW swell fills in. There's a good chance that Torquay will seen an early W/NW breeze and the mid-period energy will be generated by a broad and elongated fetch of strong W/SW winds moving in behind the strong low this evening. The Surf Coast should hold 3ft+, with 4-6ft sets on the Mornington Peninsula most of the day, then easing from 3ft and 4-5ft Friday morning. Unfortunately winds will be onshore Friday out of the S/SE tending SE, so make the most of the coming couple of days. Winds will swing back to the E/NE on Saturday morning favouring the beaches to the east with fun easing 3-4ft sets, 2ft on the Surf Coast. Sunday morning will also be clean but small to tiny. Longer term and a series of weak fronts pushing in from early next week look to bring some mid-period swell with initially average winds, but more on this Wednesday. Just noticed the new energy in the water at 13th, quick change in the strength. Very nice Ed, thanks for the update! Looks like the whole coast is on the pump today. Hope you're all getting some of it. Excellent waves this morning, 3-4ft, no crowds, smooth and glassy. Basically as good as it gets in summer.